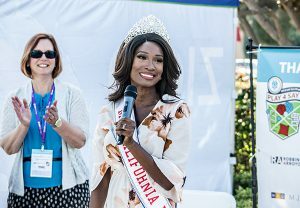 Mrs. California, Andrea McClew, speaks at Play 4 SAY 2018. Andrea McClew is a working mom of two, a military wife, and the reigning Mrs. California US America. To say she is busy is an understatement. Fortunately for Andrea, SAY’s after-school program provides her with affordable, trusted care for her children. “When my husband was deployed for seven months, I was essentially a single-parent, juggling work and appearances as Mrs. California. I really don’t know what I would’ve done without the after-school program. It’s a safe haven for my kids,” said Andrea. SAY San Diego Before and After School Programs provide a welcoming, safe place for more than 4,000 elementary and middle school aged youth, every day, enabling them to experience academic enrichment and recreation during the hours before and after the regular school day. Activities include homework assistance, arts and crafts, sports, creative and performing arts, and STEM. SAY San Diego partners with San Diego Unified Schools to run PrimeTime programming at 22 schools in the district. 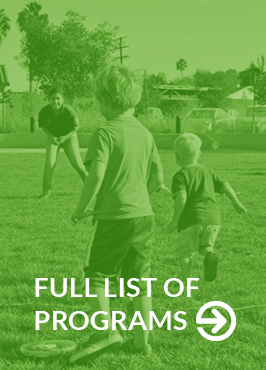 We also offer Licensed Fee-based Extended Learning Programs at 18 additional sites throughout San Diego. SAY San Diego kicked off summer with the 4th Annual San Diego Unity Games on June 23. What a fantastic day! More than 200 youth and community members participated, including local leaders, San Diego City Councilmember Georgette Gomez, San Diego Chief of Police David Nisleit, and San Diego County Probation Chief Adolfo Gonzales. 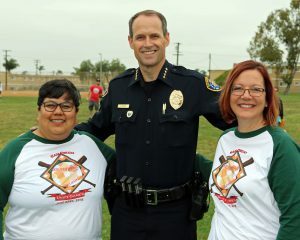 Youth, faith groups, community organizations, law enforcement, probation, and city and county elected officials, all partnered together to host the games and further goals of shared neighborhood solutions, positive activities for youth and families, and increased use of the Willie Henderson Park in Southeastern San Diego. We are very grateful to all who helped make the San Diego Unity Games possible! Also this summer, Camp Move, our camp program promoting active and healthy living for school-age children, is in full swing; we get a fresh start, as July 1st marked the beginning of our new fiscal year; we are already preparing for our Back-to-School supply drive; and of course Play 4 SAY – our annual, signature fundraising event is later this month! June offers time to reflect on the importance of family, in its many forms. At SAY San Diego, we invest in the whole family, as defined by the family, and in improving neighborhood and social conditions, to empower equity, opportunity, and well-being for children. One hallmark of our work is use of family strengthening practices across many programs. The evidence based family strengthening approach is family centered, valuing and recognizing family input and involvement; family-strengthening, engaging multiple solutions to enable families to be strong, healthy, and safe; embracing of diversity; and supportive of community connections and collaboration. In keeping with the family-strengthening approach, last month we wrote about Project KEEP, which provides a solid support system for foster and kinship caregivers of children ages 5-18 years. 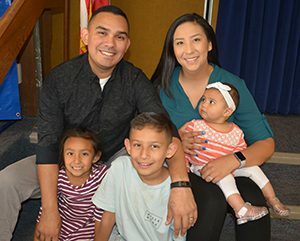 Below, you will learn more about Dads Corps, SAY San Diego’s unique program that provides peer support and educational opportunities for active duty and veteran military fathers. This month, we are also thrilled to announce that SAY San Diego has been recognized for its leadership with two awards. 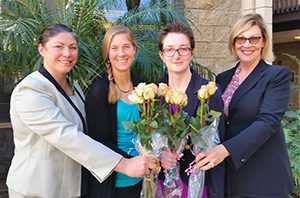 Our Cognitive Behavioral Therapy program and its entire staff team were recognized by the San Diego County Probation Department for their leadership in Evidence Based Treatment Practice. Then on June 14, SAY will receive national recognition with the Organizational Excellence Award given by the Network for Social Work Management. May is National Foster Care Month acknowledging foster parents, family members, volunteers, mentors, policy makers, child welfare professionals, advocates, youth in foster care, former foster youth, and all members of the community who advocate for youth in foster care and their families, and who provide permanent, safe homes and caring connections for them. Here at SAY San Diego, this month and every month, we are committed to ensuring a bright future for more than 2,100 children and youth in foster care in our county (down from nearly 4,900 a decade ago). We celebrate all who work daily, as we do, to prevent child abuse and neglect, prevent out of home placements, heal trauma, cultivate nurturing family bonds, and make a meaningful difference in the lives of children who suffer the trauma of abuse and neglect. Over the past 9 months teens from Mid City and Southeastern San Diego directed their creativity and passion toward understanding why so few clean and safe outdoor areas exist in the community and finding solutions to those negative influences. Opening the Outdoors is a project spearheaded by SAY San Diego, in partnership with AjA Project and local schools in the Mid-City area, and with Project Aware Inc. and The SOULcial workers in Southeastern San Diego, with generous funding support from the San Diego Foundation. Through the prism of photography, teens identified Officer Jeremy Henwood Memorial Park as an important asset for the community and asked that more events and opportunities for artistic expression be offered to youth and families in City Heights. Celebrating SAY San Diego Volunteers! Each and every day, volunteers, business partners, community and student service groups, and interns pursing their academic goals give the gifts of their talent and time to SAY San Diego. They form the heart of our community! Our volunteers contribute in a wide variety of ways, as role models, experts in law, tax, design, real estate, and as tutors, event organizers, counselors, video producers, photographers, interpreters and translators, coaches and leaders of youth development and recreational activities, as well as community leaders and board members. SAY’s fantastic volunteer force outnumbers our workforce, allowing us to reach more people than our financial resources would otherwise allow. Our volunteers and interns give meaningfully of themselves to the tens of thousands of children, youth, and families who make up SAY San Diego’s clients and communities. Celebrating Early Literacy in March and Every Day! 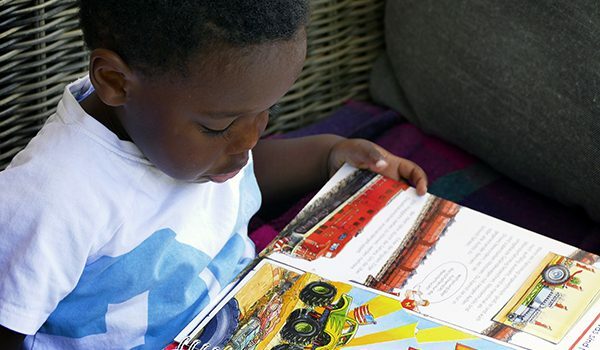 Early Literacy Month is inspired by Dr. Seuss’ birthday in early March, as well as broad-based research and understanding of how early language development and literacy are essential for cognitive growth and learning in young children. What we see every day at SAY San Diego is that children who have lots of engaging experiences with stories, books, songs, poetry and language in general absorb the rhythms and patterns of language and, at surprisingly early ages, begin to imitate the language and gestures they see and hear. On Saturday, February 24th, over 150 City Heights parents, students, school principals, and district leaders came together at Monroe Clark Middle School for a morning gathering to participate in a unique effort to dialogue on the complex and varied factors affecting our schools and provide direction to the district on how it should budget to address these factors. The 2ND ANNUAL LCAP (Local Control Accountability Plan) COMMUNITY DIALOGUE ON EDUCATION was hosted by SAY San Diego’s Crawford Community Connection – Parent Student Resident Organization (PSRO), in partnership with SDUSD, The Global Arc, Hoover Wellness Council, United Women of East Africa, Comite Organizador Latino de City Heights, the International Rescue Committee, Karen Organization of San Diego, Sterlington Consulting, and the California Endowment. Attendees collectively reviewed data regarding student chronic absenteeism, school suspension rates, English Learner progress, college and career preparedness and other issues. They were then invited to explore and identify ways to address these pressing issues. At the end of the day all of the feedback was collected and folks were invited to be a part of the process to compile the information and develop a document to be presented to the SDUSD in the next month. We Did It! $91,935 Raised! Thank you for supporting SAY San Diego’s Champions for Youth campaign! This year we raised nearly $92,000 to support children and families in our programs. 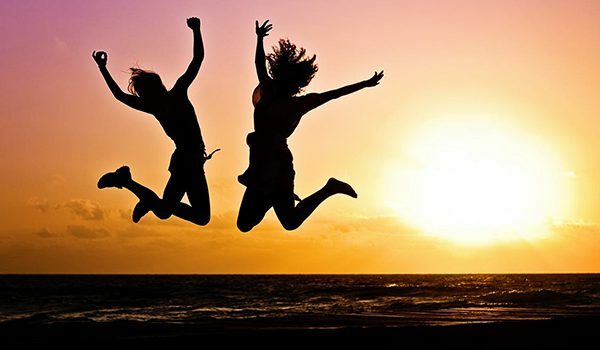 Because of your generosity, we raised more than ever before, including $30,000 in bonus funds! Talented Grad Students Boost SAY’s Social Innovations! By establishing creative partnerships with local, world-class universities, SAY San Diego has tapped into the ingenuity and fresh perspectives of talented graduate students. They are exploring new social innovation programming for us that builds on our organization’s strengths and values, with great promise to meet unmet and urgent needs. 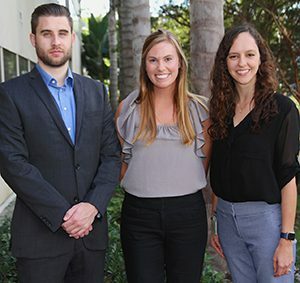 Starting in October 2017, three second year master’s degree students from San Diego State University (pictured left) joined the SAY San Diego Board of Directors as Board Fellows for the course of two semesters. Sponsored by SDSU’s Social Policy Institute, at the School of Social Work and the Fowler College of Business, the purpose of the fellowship is to introduce MSW and MBA students to board roles in nonprofit governance and leadership, while also engaging them in an innovation project with a board member, staff and the local community. Their innovation project, still underway, addresses the serious unmet need for high quality, affordable infant and early childhood care. The Board Fellows Program is guided by Steve Hornberger, MSW, Director of the Social Policy Institute, SDSU. Over the Winter Intersession, SAY San Diego benefited tremendously from our engagement with students in the Master’s in Social Innovation Program at University of San Diego. Four students (pictured right) served as social enterprise consultants to help us explore new possibilities for valuable programming within our Child and Youth Development impact area, where SAY serves more than 4,500 children and families every day. They explored the needs and interests of parents and children through a series of interviews, analyzed the market, and reported on possibilities for partnerships and financing, under the guidance of Karen Henken, MBA, Professor of Practice, Social Innovation and Entrepreneurship at USD, Kroc School of Peace Studies.